How do you hold an engaging, informative and worthwhile staff meeting for 130 staff? This was the question I had to ask myself when the principal asked that I do some “technology stuff” at the next staff meeting. One hour with 130 people to create real professional learning?! The task seemed way too big. Thankfully, I remembered speed dating. I’ve been speed dating before and I’m not ashamed to admit it. It’s actually quite fun. A few drinks for social lubrication then the night begins. You sit down with somebody for seven minutes, then the bell goes and you’re off to the next one. Turns out you can talk to anyone for seven minutes. 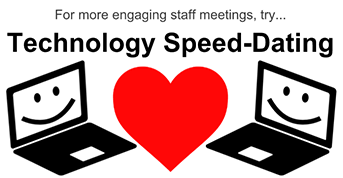 So Technology Speed-Dating was the idea I had. 130 staff spread out over 5 classrooms. Two presenters in each classroom. Spend 10 minutes in each room, then the bell goes and you move on. Here’s a little diagram to help you out. What a fantastic staff meeting it was! Every presenter was a real teacher from our staff, presenting real use of technology in their classroom. It was authentic professional development from those at the coal face. Too often tech PD gets bogged down in “First you need to login, now click this button, then do this, oops, wrong button, go back, oops, Wifi, try again. Now click this button”. That’s just not engaging. With only five minutes for each presenter it was all about the high level ideas. What does it do? Why is it good? How do I use it to increase learning? The important stuff. Presenters were told to wave away any questions like “but how do I login” with a hand wave and a, “oh, you can cover that stuff later”. Oh, that technology tool won’t work in your particular classroom? No problem, because in five minutes you’re going to hear all about a different tool that does work for you. I’m confident that every teacher walked away with a new idea for how technology can make learning in their classroom work for them. Because after all, Every teacher is a snowflake. We could have done a similar thing in a larger auditorium with each staff member presenting to 120 staff for five minutes but this format had a much more collegial feel. 24 in a room allows the audience to ask real questions and have real conversations with the presenters. The time when staff were moving from room to room was filled with a buzz of conversation about the last tool they saw. Teachers talking about similar tools they use, about how it could work in their classroom, asking each other questions about certain things. So much collaboration. This format wasn’t overly taxing on our teachers, as they only needed to talk in broad terms about a tool they were using and liking in their own classroom. Anybody can talk for five minutes on a topic they’re interested in. More importantly though, they were recognised and congratulated by their peers on the exciting work they were doing. This kind of recognition emboldens teachers to get involved and keep pushing things further. This wasn’t a token “teacher of the week” type celebration. This was an authentic celebration of the work these teachers are doing. Of course now we need to strike while the iron is hot. Staff can expect to receive video tutorials explaining the technical side of each tool in the next 24 hours. We’ve also put some time aside for staff to meet in small groups during our weekly assembly to help each other use the tools. Again, we’re breaking down our silos, de-privatising our practice and working collaboratively. Don’t have the time to Flip your class? Think again. Thanks for sharing – this was a great post – loved the concept. Love this idea! No time for burnout, just great ideas and applications. Nice idea Joel. I am going to try this. Awesome ideas. I can see how this would be very successful. Allowing teachers to lead the learning is a great step in personalizing PD!